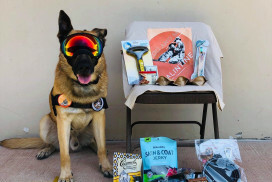 Our quarterly care package contents are based on constant communications with home station Kennel Masters and deployed handlers themselves to supplement veterinary care provided by the military services. Military Working Dogs have their own supplies of food, nutritional supplements and medications such as flea & tick control and heart worm preventative. These are prescribed, supplied and monitored carefully by the military veterinary staff. 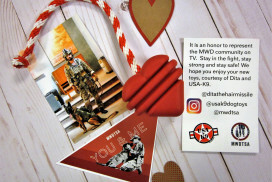 MWDTSA care packages are sent four times a year. Each package is shipped in a 12” x 12” x 6” box and costs $17 in postage. MWDTSA only sends quality items. First, because our teams deserve it and secondly, because the cost of shipping is too high to send something that will not be used. We select only items that are intended for hearty, active Military Working Dogs. Belgian Malinois, German Shepherd Dogs and Labrador Retrievers are the most common dogs selected by our military. If you have any question about the suitability of an item to be donated, please contact us at info@mwdtsa.org before sending. Donations received that are not acceptable for our MWD/handler care packages will be forwarded to a suitable animal shelter or rescue group. The easiest and best way to get us the items that we most urgently need is by making a financial donation. If you happen to know of a good company that you believe might like to make a "Product in kind" donation, please contact us at info@mwdtsa.org. If you choose to shop outside our "Amazon Wish List" and send items directly to us, here are some of those items that are needed year-round. Chuckit Fumble Fetch dog toy (Orange/Blue, size Small)?